I’m super pleased with this one. Such a great feeling when you make something AND when it feels good when you wear it. I don’t think much tops that when it comes to clothes. Having made a lot of clothes for myself over the past 9 years or so I learn a little bit every time I finish something. I learn stuff sewing-wise of course, but I’m talking more about learning about what types of fabrics I like to wear, what silhouettes I like, and what I might reach for over and over again vs. sending off to a friend or donating. The Coram Top (pattern by Indiesew) is pretty much my dream top. I say that because I love a raglan sleeve and I love the hem. Simple silhouette, but with some interesting details that make it more than just a plain top. I’ve been trying very hard over the past 7 years or so to evaluate what I’m keeping in my closet. It stems much further than my closet, but since we’re talking sewing, I’m going to dive a little deeper into my clothes. This is such a huge topic for me daily. I think about simplifying all the time, but I still don’t have a definite answer. I feel like I step closer and closer, but I haven’t found that spot yet where I feel like “Okay, I have arrived at the perfect balance.” A big piece of the puzzle for me is that my taste keeps evolving. I don’t have one specific set of rules that makes a great piece of clothing, but two criteria that I know I need in a handmade garment is 1. fun to sew and 2. feels good when I wear it. And I think I’ve definitely found that in the Coram Top. It’s a straightforward design with some great details: beautiful shoulder darts, some flat felled seams, great looking cuffs, and a cute split hem. The white geo daisy print is one I purchased from Indiesew right when it came out. You know me, give me black and white with a hint of daisy and I’m on board. I love how drapey and fluid it is! It also made me really slow down when I was sewing, which is probably a good thing. With shifty slippery fabrics it’s good to go slow and take your time, they require a little bit more finesse than something more stable. The black lawn is one I purchased from Jones & Vandermeer quite a while back. I’ve been waiting to pair it with the perfect pattern and I’m so happy with how it turned out, too. I don’t often sew two of the same of any pattern for myself, although I do have some really favorite pattens I need to make again (I’m looking at you Josephine Top!). It was also interesting to compare the different fabrics and how there were slight differences while sewing as well as how they look in the finished top. The neckline of the geo daisies I did have to shorten, as Allie suggests, so that was an excellent tip to the get the neckline to lay just right. It feels really great to have these two tops to reach for now in my closet. I’m a member of the Indiesew Blogger Team this year! I did purchase both the pattern and fabrics for these projects, but am being compensated for my blog post. However, all opinions are, as always, my own. I have never heard of this pattern but OH what a nice top! I especially love the black one! What a great addition to anyone’s wardrobe. 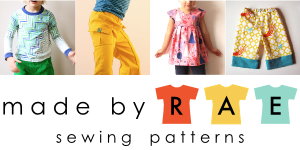 Love reading your reviews and ideas about the various clothing patterns you have tried. The two tops you made up look terrific, I especially like the black one. Thanks for sharing them with us. Enjoy the journey. These are both pretty but the black one is my fave! Which comes as no surprise of course! Love the pics against your brick wall too! that is truly my perfect top too!! I so envy your abilities in the garment sewing arena. I am truly only comfortable in 2D world of quilting. Someday I hope to try it and perhaps this will be my go to pattern. Honestly, I have so many quilty things to create I’m not even wanting to try right now, except when I see this and it looks so clean and perfect on you! I am green! love it! and what a great pairing of the fabric and pattern. bravo!! I would love to have both these tops in my closet. Enjoy them! It’s so true that simple tops made of fabric we love to wear that go with everything are staples in our wardrobe and we can never have too many of them! Love everything about this top for summer – woven (so much cooler than knits at 30 degrees Celsius!) raglan sleeves and a nice long curved hem that looks like with all sorts of cool bottoms from pencil skirts to capris to long shorts! Beautiful tops! I used to sew most of my clothes. When I found a pattern I loved to make and wear, I would make it over and over, tweaking it in small ways. I loved a Vogue pattern and made it into dresses and tops. I like this top but would prefer it in an easygoing knit. Both of your tops look great. I also struggle with clothing and have really tried to streamline my closet to what looks good and what I will wear. I like both the pattern and drape of your fabric. I’m going to have to look the pattern up and give it a go! I’ve been looking to sew up myself some work shirts and this is perfect. I love the design and style. I love the fabric choices you made. The fluid drapey fabric always sits better with me as well. It’s so much more flattering (and it doesn’t wrinkle!) Thank you for sharing this. Was it trickey to get the neckline done? I wonder if it’s fiddly or difficult.